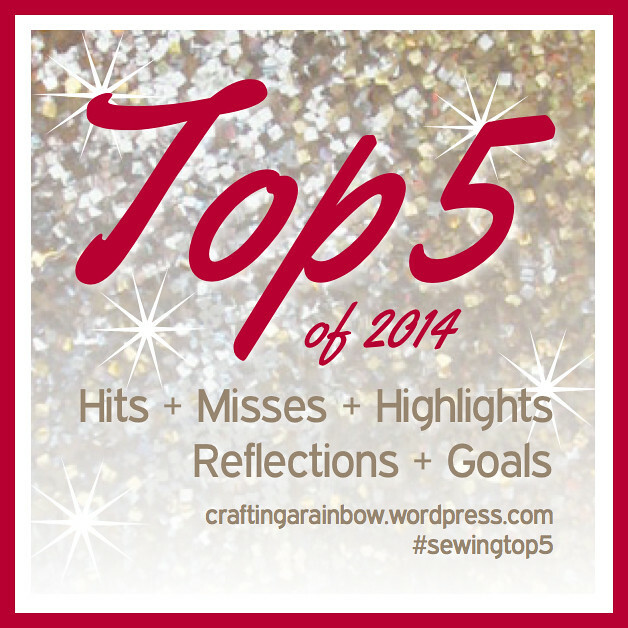 Top 5 of 2014: Hits + Misses! Hi, guys! A belated Merry Christmas to you, if you celebrate, and an early Happy New Year! Hope the holiday season is finding you well and with plenty of time to hang out with loved ones and just relax! One thing I’ve loved about the end of the year the past two years has been participating in Gillian‘s Top 5 posts. It’s really fun to stop and reflect on the previous year, and to move forward into the new year with a better idea of what you love to make and wear. So I’m excited to do it again this year! OK, let’s start off with the misses. They’re the most fun, right? I got tricked by the fun fuchsia animal print into buying a fabric in a color that I hate hate HATE wearing. There’s something about pale grey that makes me look and feel gross (which is weird, because I love medium and dark greys). Also, this shape was a new one for me, and I fell into the old trap of sewing something that I would never buy in a store. I wore this a few times, but ended up giving it away. I can’t even stand looking at these photos! I hate black pants (they’ve also been given away) and my skin looks LAVENDER in these pics. Yuck! Well, at least it was fun to sew! I couldn’t think of a single way to wear this- it doesn’t go with anything in my closet and it looks especially idiotic with my usual low-cut jeans. I never sewed anything to pair it with, which probably tells you how much I liked it. Dumb fabric/pattern pairing! Here’s another garment I didn’t wear even once. There’s just something about it that I don’t like, which is a shame, because I loved the fabric. It wrinkled when you just looked at it, and was kinda messy as a result. Plus, looking back at these pics, I just don’t think I got the fit right. I’d love to have a go-to shift dress in my arsenal, but I haven’t achieved that yet. Blerg! Why did I spend hours and hours and hours and hours knitting a cardigan when I don’t even like wearing them? Why did my buttonholes only fit buttons better suited for a clown? Why do bad sweaters happen to (basically) good people? WHY? OK. IN MY DEFENSE, everyone on Pinterest wearing a crop top + midi skirt combo looks super cute! But my proportions are off and this is Frump City, Population Me. Also, HOLY COW, my FAR too anatomically-correct pattern placement!!! Try and tear your eyes away from the, uh, headlights. TRY. This whole outfit is an atrocity. 5.) Style Arc Romy Anorak! This project was a real learning experience for me, which I loved. I had never really been into more detailed projects, but after this, I could totally get the appeal of taking on something difficult. It’s a real confidence builder to work through something without good instructions and to find your own way of doing things when you want to change up a pattern. Best of all, I really like the end results! I wore this tons and tons this year, and loved that it replaced an ugly “technical” jacket that I never felt good in. I made this at the tail-end of warm weather (like, late October), so I didn’t get to wear it much this year, but man, oh, man, do I love it! I love the exaggerated shape, the color combo, and the bold print. It’s just so fun! Plus, it felt like a collaboration between myself and several cool, fun bloggers, none of which I’ve ever met in real life, and I love that it’s a testament to the strength and warmth of the weird and amazing online sewing community. I’m so excited to wear this come spring! This was my jam for summer 2014! 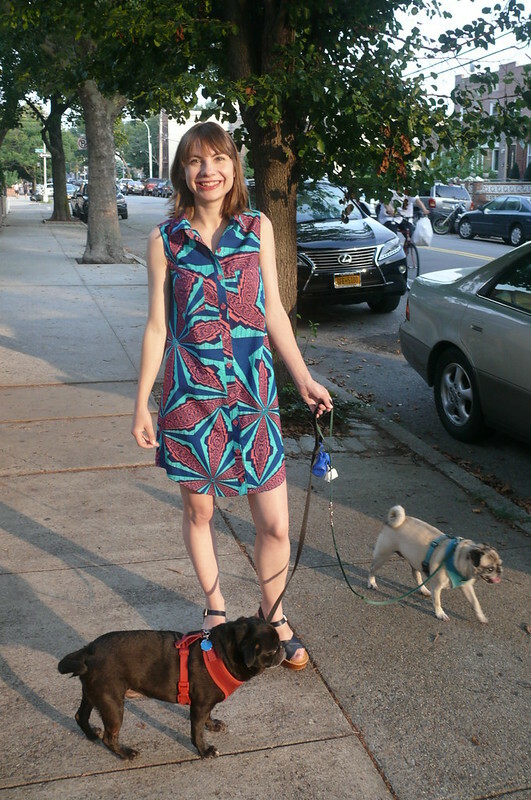 I looooooved the Alder Shirtdress pattern, so much, in fact, that I made three versions! This one is my favorite- I finally worked up the nerve to cut into a treasured piece of Vlisco wax print, and I’m so happy I did! 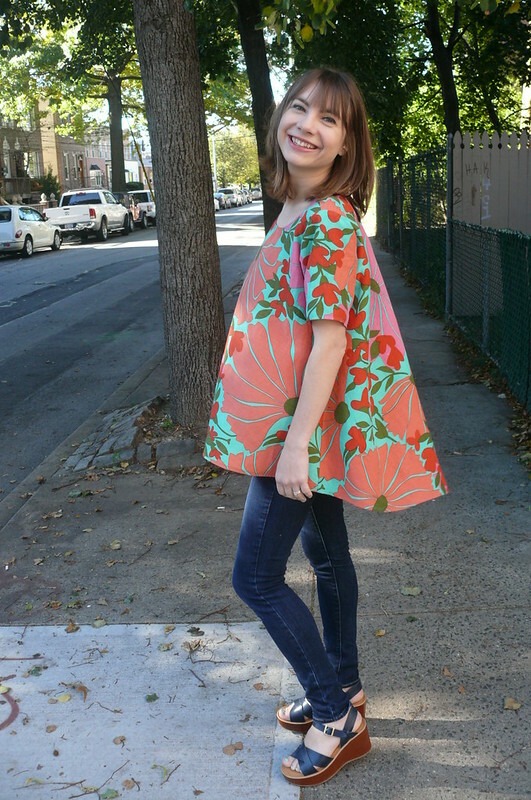 The large-scale print pairs happily with the loose silhouette and it’s just so fun to wear. This was my summer uniform and I felt so happy and at ease in it. I made a concerted effort to sew more wardrobe basics this year, and I’m really happy that I did. I’m a really, really casual dresser 90% of the time, but you would never know that from the way I used to sew! The unfortunate side effect of not shopping, but also not sewing basics, was that my everyday wardrobe was in terrible condition at the beginning of this year. You could find me most days in some sort of ugly, worn, free, unisex t-shirt, paired with an ugly, worn, free, unisex hoodie. It’s hard to feel confident dressed like that! Enter the Papercut Patterns Undercover Hood, the other pattern I made three versions of this year. It’s wearable, looks really different made up in different fabrics, and has made dressing easy and fun during the week. 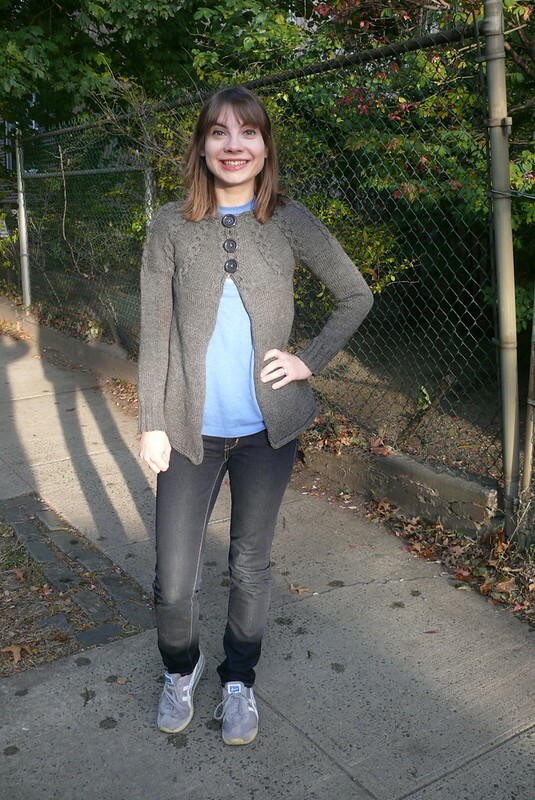 This wool jersey version, based on an Isabel Marant sweater I saw a picture of and loved, is my favorite by a mile. It should be hard to choose a favorite garment for the year, but this was a no-brainer. Every time I look in my closet, it just jumps out at me… I love it! If I could only use a single piece of clothing to tell people who I am, it would probably be this dress. It’s bright, fun, and relaxed, things that I hope describe me (on good days). I love love love this fabric (another peer pressure collaboration THANKS CHARLOTTE) and I’m so glad I used it on a favorite pattern! It was another occasion when I finally had the courage to cut into a beloved stash fabric, and I was so pleased that I did when the dress was done. Yay! Alright, guys, I’m really excited to hear about your hits and misses this year. Tell me! What were your biggest triumphs? Worst disappointments? Anyone else have a pattern placement problem that made a garment a bit too anatomically-correct? Do share! 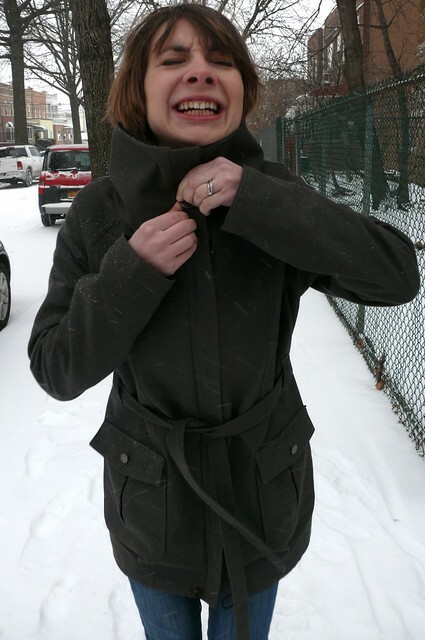 Ginger Made: Style Arc Romy Anorak (Or, the Jacket that Took Forever)! Yowza! It’s cold out here, people! I am not on board with this weather! 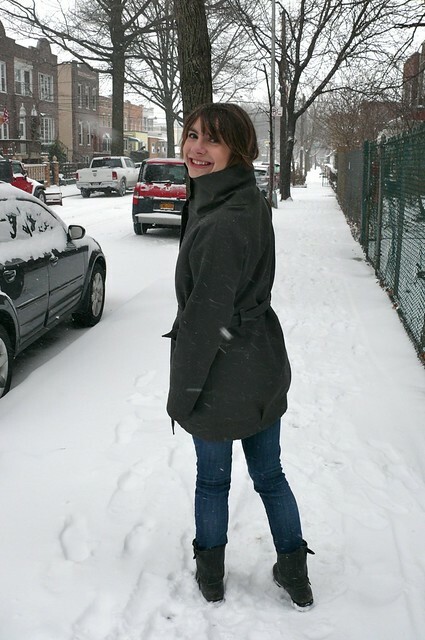 I left behind snowy New York this week for the even-more-frozen tundras of Vermont. 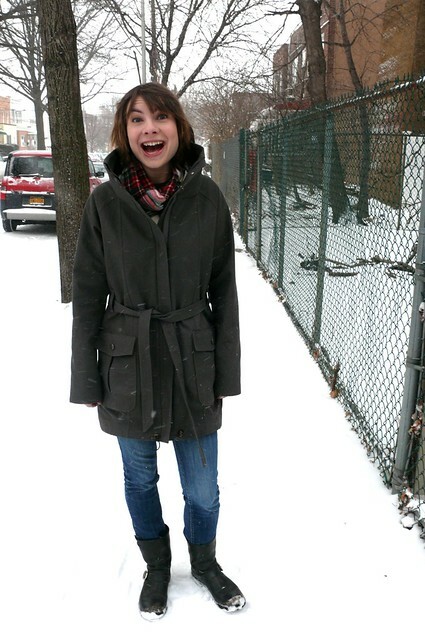 I am NOT excited about the cold, but I AM excited to finally show you my new jacket! 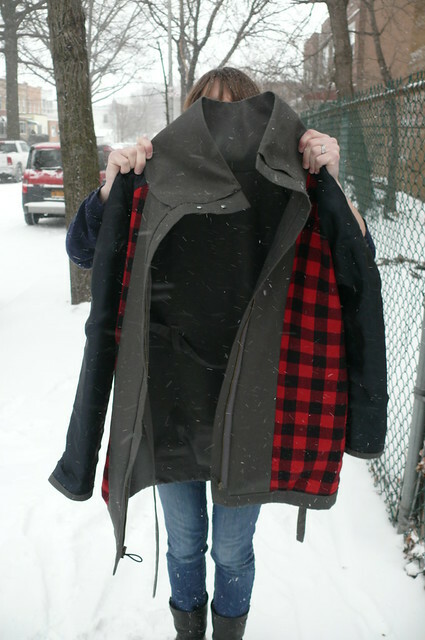 This is the Style Arc Romy Anorak pattern, and it’s my January project for the Mood Sewing Network. I’ve been working on this thing for what feels like the entirety of my life. OK, it was closer to 2.5 weeks, but between the RTW details, winging it and adding a lining, and attempting to decipher the illustration-less, minimalistic instructions, this one was a real marathon. First things first: this pattern is super cool and I adore the style, but it’s NOT for the faint of heart. There’s absolutely no hand-holding here– the instructions offer helpful advice like “Make belt loops and attach them”. They don’t tell or show you how to do this, the pattern piece (one single long strip) doesn’t give you any details, and the placement markings for the side front belt loops aren’t on the pattern piece, so you have to measure/eyeball to figure out where they go. That’s pretty much par for the course here. This is at least an intermediate pattern– I would really only recommend it to a confident sewist who doesn’t mind figuring things out on her own. It didn’t help that I strayed from the instructions and added a lining. I had to completely change the order of operations to accommodate that, but it was worth it (unlined jackets are kind of pointless in my climate). OK, some more pattern details: it has raglan sleeves with darts at the shoulder, which I haven’t seen before but is a nice detail. There are tucks right above the hem in front and back, and elastic is inserted in the hem so you can cinch it in if you like. The zipper is hidden behind a fly guard, which feels very RTW to me. If you’re not familiar with Style Arc, their patterns come in a single size. I wasn’t super stressed about this because I’m pretty close to a straight size and this isn’t a very fitted style. 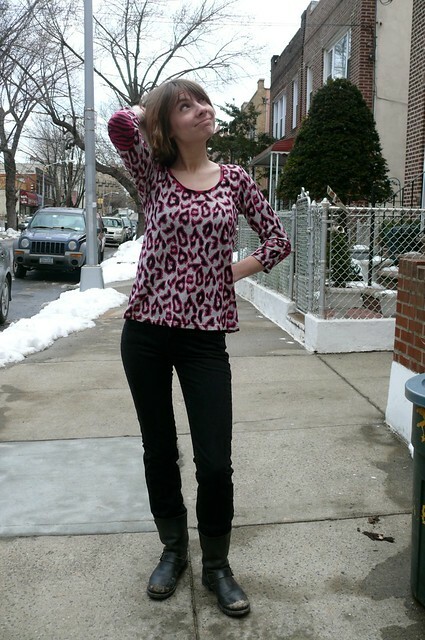 I made this without any alterations and the fit is roomy, but works for the style. If you make this yourself, check the zipper and button placement and make sure it works for you. I followed the diagrams for zipper and fly guard placement, but it feels backwards to me– when I try to button up the collar, it’s really awkward and hard to do. 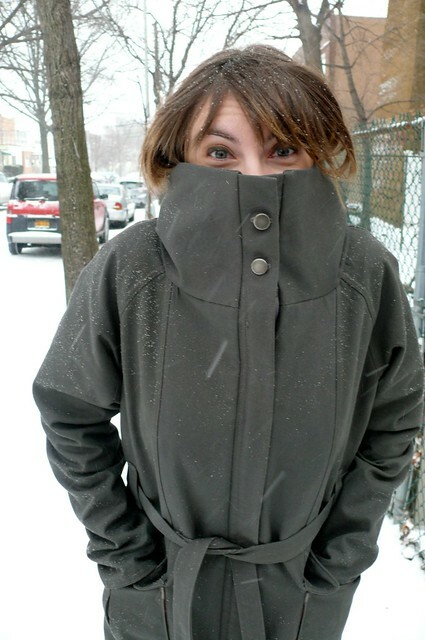 While I’ve really been digging the trend of slouchy anoraks that all the cool Brooklyn babes seem to be wearing lately, I’m not super into the ubiquitous olive green that seems to be the only color these jackets come in. Instead I opted for a nice medium gray cotton twill. I love twill– it’s my go-to fabric for hard-wearing, good-looking garments. I love how it looks when it starts to show some wear and tear. Because twill weaves fray easily, I serged all the seams, even though they would be hidden under the lining. 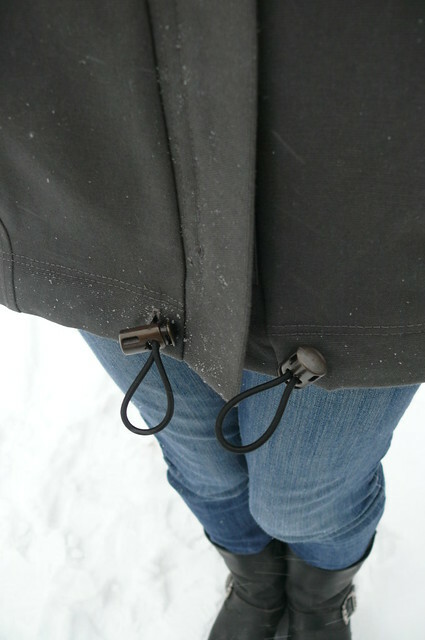 It’s a nice precaution to help extend the life of your jacket. I topstitched all the seams with a twin needle (OMG, WHY WAS I SO SCARED TO USE A TWIN NEEDLE?! It’s stupid easy! ), which gives it a RTW look and also adds some stability. 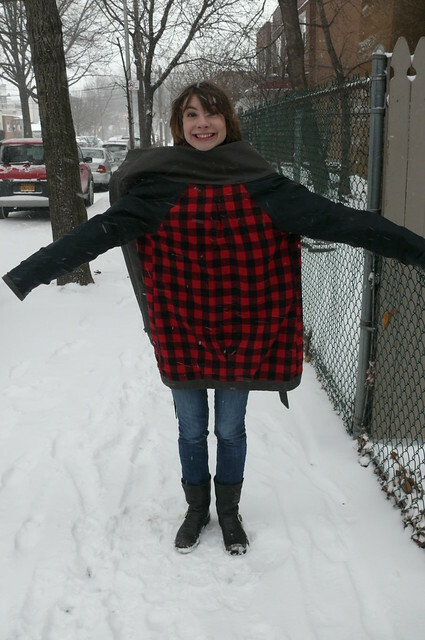 Since I’m the world’s biggest wimp, I added a lining made (mostly) from buffalo check flannel. It’s so warm and cozy! The sleeves are made out of black bemberg rayon– I get nervous that I’ll rip my lining putting on the jacket if the sleeves aren’t slippery! Since brushed fabrics have a tendency to pill over time, I made the lining with the unbrushed side of the flannel facing out. It’s still beautifully soft, but should stay in great condition longer. I basically made a second version of the shell and basted it to the neckline and center front before stitching on the collar and fly guard. I made a booboo when I was cutting it out and forgot to add a CB pleat in the lining, so after consulting the experts (the Twitter sewing crowd!) I cut a strip of fabric the length of the back bodice and stitched it in, so no harm no foul. The lining pieces were all cut at the hem line, so I just pressed the hems up over the lining, enclosing all the raw edges. I fell stitched the facings and inner collar down with about 488,135 teeny-tiny stitches… my finger and thumb are still sore! The pattern calls for the pockets to be made with a box pleat that’s stitched down all the way. I wanted the pocket to expand to hold tons of stuff, so I used an inverted pleat that’s only stitched 2″ from the top and the bottom, so it can sort of bulge out. I find it annoying to iron under all the seam allowances when I’m making patch pockets, so I opted to line them instead. I cut a second pair of pockets out of the plaid flannel, stitched them together at the sides and bottom, then turned them right-side out, turned under the top seam allowance, and edge-stitched all around. 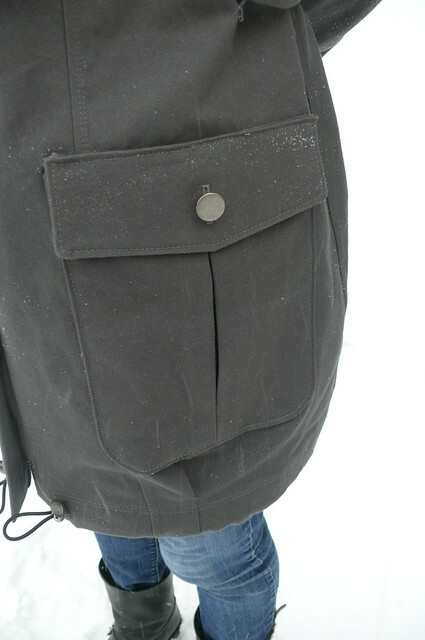 This makes for nice, neat pockets, plus my hands will stay warm in happy flannel-lined pockets! We allllll know how much I love flannel-lined pockets! (Sidebar: Can someone please make sure my coffin is lined in flannel? Oops, got a little morbid there… but still– MAKE IT HAPPEN). I wanted this to look very clean and RTW, so I used brushed antique nickel jeans buttons from Taylor Tailor that I had in my stash, a matching separating zipper, and two faux metal toggles at the CF hem. I’m really pleased with the way they look! 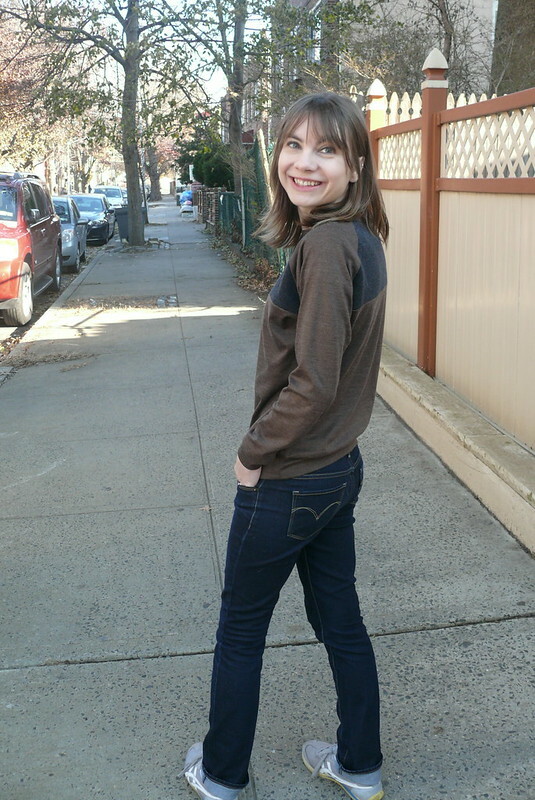 Oh, and if you want to get in on the jeans button fun but aren’t sure where to start, here’s a great tutorial from Taylor’s blog (spoiler alert: you get to use a hammer! In the end I discarded the belt loop pattern piece and just followed this great tutorial from the Coletterie— you don’t have any raw edges, and you don’t have to turn a loop! In the end, I’m over the moon about this jacket! It’s just exactly my style! Isn’t that the best thing about sewing? It took forever to make, and even though the pattern was frustrating, it’s so rewarding to sew something that you can actually get away with wearing day in and day out, and that you’ll love wearing all the time! While I’m thinking about it, if you want some serious jacket inspiration (and envy! ), check out Kelly’s gorgeous Minoru! It’s stunning! What are you guys sewing these days? Are you sewing for the season, or jumping ahead to the next one? As much as I dislike winter, I’ve still got some cold weather items on the docket to sew before spring sets in. What about you?